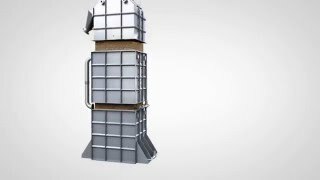 Van Beek has developed the eggshell dryer for drying crushed eggshells in a continuous industrial process. This dryer heats the eggshells to 130 degrees to give a pathogen-free, fine-grained and high quality lime with a maximum moisture content of 1%. MILLBURN, NJ – A new Vibro-Bed” circular double-deck fluid bed processor system from Kason Corporation simultaneously dries and cools while reducing capital cost, energy usage and cleaning time, according to Henry Alamzad, President. HERRSCHING – The company Chinoin Zrt., subsidiary of the French pharmaceutical company Sanofi, is represented in Hungary at the three locations Budapest, Csanyikvölgy and Veresegyház. MILLIS, MA – Radio Frequency (RF) Pasteurization of food products was introduced by RFC in the 1960s and has since then grown into one of the preferred methods for the pasteurization of dry food ingredients, spices and protein supplements, including both animal and plant proteins powders. MILLIS, MA – A new RF drying system for rapidly drying temperature sensitive materials such as filter cake and granular or pelletized materials is available from Radio Frequency Co., Inc. of Millis, Massachusetts. HERRSCHING – Many applications require a very homogeneous end product with short drying times. In the food industry, in many cases, valuable and sensitive products are processed that need to be treated gently. SENDEN – KREYENBORG has offered a Far East company a unique solution of drying PTFE / SAN by means of the infrared dryer. SAGINAW, MI – Effective drying is often a crucial step in many production operations. In addition to its obvious importance in developing an attractive and usable product, it is frequently utilized to: facilitate product handling, reduce shipping costs, increase process equipment capacity, and optimize product preservation during shipment and storage. DOETINCHEM – In response to increasing market demand for high temperature powder processing Hosokawa Micron B.V. has developed a range of new technologies that address the requirement for processing temperatures up to 325⁰C.